Flat-less - with a purposeful trekking tread. Asphalt or off-road? Everyday use or bicycle expeditions? This versatile tyre always does the job. Its robust construction handles almost any mistreatment. Protected by SmartGuard, the most effective puncture protection belt available for bicycle tyres. It is impossible to guarantee that a flat will never happen, but the Marathon Plus has the best defense against everyday tyre wreckers such as glass, flints or metal shards. Use a pressure gauge to adjust tyre pressures as the common "thumb check" is insufficient due to the special construction of the Marathon Plus. trying to decide about these marathon plus tours as replacements for the schwalbe hurricanes with kevlar guard i've been buying for ages. the marathon plus tours are much heavier and i'm keen to understand how they roll compared to the hurricanes - any comments, suggestions? The Marathon Plus Tour tyres will roll slower than the Hurricanes, but not by much so in most conditions you may not even notice it. 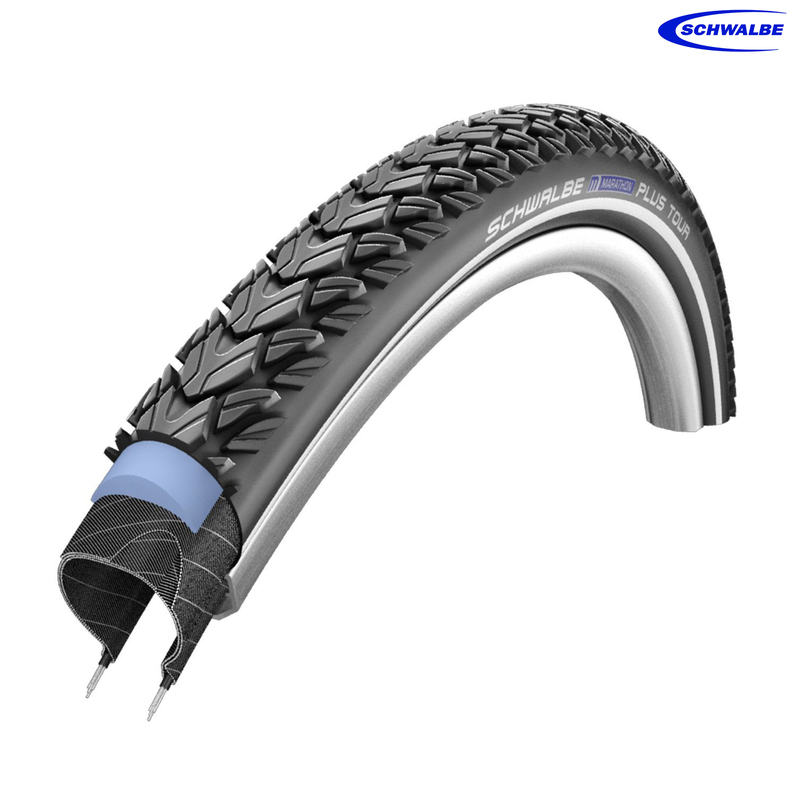 The Marathon Plus Tour's do offer much better durability and puncture resistance than the Hurricanes though.